V.I. 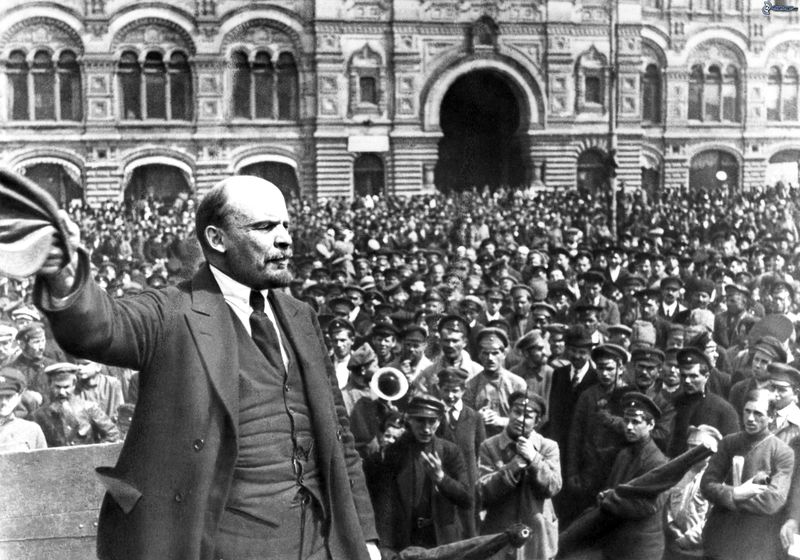 Lenin speaking to a crowd. The year 2017 marks the 100th anniversary of the Russian revolution. The 1917 revolution stands out as the greatest event in history – so far – though its significance has undoubtedly been tarnished and obscured by the grotesque degeneration of the Soviet Union and the remorseless denigration by capitalist apologists. 1917 was an elemental mass movement against a viciously exploitative ruling class. The oppressed workers, poor peasants, soldiers and other exploited layers, who suffered intensified exploitation during the imperialist world war, rose up and overthrew the rotten tsarist regime and the ruling class of capitalists and landlords. For the first time in history, a revolution – under the leadership of a revolutionary party, the Bolsheviks – established a government based on the working class and other exploited layers, and sustained this regime against military intervention and an economic siege. The soviet form of government was based on the mass, democratic participation of the masses. This “festival of the oppressed” involved an outpouring of discussion and debate in which the masses expressed their grievances and aspirations. This was recounted in John Reed’s book, Ten Days that Shook the World, and in Victor Serge’s Year One of the Russian Revolution. This profound movement struck fear into the bourgeoisie internationally, who immediately organised armies of intervention to support the “Whites,” the bourgeois/feudal counter-revolutionaries. The revolution was triggered by a mass demonstration of women workers, and the revolution saw the mass involvement of working-class women activists. The soviet government established many rights for women, long in advance of many west European parliamentary regimes. Unavoidably, there were difficulties in giving substance to these reforms, given the extreme economic conditions that prevailed in the early years of the soviet government. There was a tremendous outburst of creativity – in the arts, theater, architecture, and other cultural fields – that had an international impact. A forthcoming exhibition of Russian art at the Royal Academy in London, however, will be used as a tool to try to denigrate the achievements of the revolution. The soviet government, swept into power by the revolution, faced immense problems. The working class was a minority in an overwhelmingly rural society, numerically dominated by the peasantry. Russia was an economically and culturally backward country, devastated by the first world war. Moreover, the revolution was isolated by the defeat of revolutionary movements in more developed countries, such as Germany, which had a much stronger working class. Lenin and Trotsky, the foremost leaders of the revolution, had no illusions – the Russian revolution could only be carried through on socialist lines in collaboration with international revolutionary developments. Given the isolation of the revolution in a backward country, the process of bureaucratic degeneration began early on – with Stalin at its head. Lenin fought it until his death in January 1924. And Trotsky resisted bureaucratization and fought for the restoration of workers’ democracy from 1923 to his murder by one of Stalin’s agents in August 1940. Bourgeois historians may deplore Stalin and the reactionary bureaucracy on which he based himself, and denounce the grotesque totalitarian regime he constructed. But they are never prepared to support the ideas or the record of Trotsky. Through the International Left Opposition, Trotsky consistently fought against the degeneration of the revolution. Yet the example of the Russian revolution and its achievements in its healthy period will never be obliterated. Economic planning, despite the bureaucratic distortions of Stalinism, raised Russia from a backward, semi-developing economy, to a powerful modern state in 50 or 60 years, though at tremendous human cost. In a later period, in the years immediately prior to the collapse of Stalinism after 1989, the planned economy in its undemocratic, Stalinist form proved that it had exhausted its potential for growth. Socialists, Marxists and militant workers around the world will be celebrating the example and the achievements of the Russian revolution. At the same time, during 2017, the bourgeois propaganda machine, involving the press, TV, academic books, exhibitions, etc, will be cranked up to denigrate the idea of social transformation in general and the 1917 Russian revolution in particular. The propaganda excesses of 2017 will no doubt exceed the excesses of 1989, when the fall of the Berlin wall signaled a generalized process of the collapse of Stalinism. The bourgeoisie internationally launched a “kulturkampf,” an ideological war to discredit the idea of socialism and a planned economy. They promoted the idea of the “end of history,” meaning that the ultimate achievement of civilization is parliamentary democracy and the free-market economy. In that period, the capitalists internationally appeared to be highly successful, in stark contrast to the chaos and collapse of the Soviet Union and east European regimes. Capitalist governments no longer felt under pressure to maintain a “welfare state” to counter any advance by the Stalinist bloc. Finance capital was given a free hand and was awash with profits. Globalization accelerated, and the new combination of neoliberal conditions allowed governments to launch an assault on workers’ rights and living standards. Up to 2007, international capital appeared to be highly successful. But today the picture is very different. Capitalism faces worldwide economic crisis, social instability and political convulsions. There is a crisis in “legitimacy,” where huge sections of the population reject capitalist conditions, even though they do not at this stage see an alternative. This is reflected in the election of Trump in the U.S., among other things, an anti-establishment protest vote and the vote for Brexit in the June EU referendum in Britain. But the bourgeoisie will not look upon the Russian revolution any more favorably as a result of their own predicament. On the contrary, their propaganda against 1917 will be intensified, with a horrendous barrage of exaggerations, distortion, and outright lies. A wounded beast is undoubtedly more dangerous than a sated animal. Yet, despite a new war of ideas against Marxism and revolution, the present revival of interest in Marxism will continue and be intensified. In the U.S., the primary campaign of Bernie Sanders attracted a huge layer of workers and youth who are beginning to seek a more developed form of socialism than that offered by Sanders himself, who advocates a very limited, social democratic variant. Similarly, in Britain, many of those who joined the Labour Party to support Jeremy Corbyn’s leadership challenge, and again against this year’s attempted right-wing coup, are looking for socialist ideas that embrace the idea of a profound change in society. To help counter this ideological offensive, in 2017 Socialism Today and Socialist Alternative will be publishing articles, some from our archives and some new material, to reclaim the real history of 1917 and the socialist alternative it represents.